VPI PAD-NAT20 Initial Surface Cleaning Pad 20" - Micro Parts & Supplies, Inc. Description: After first completing the ESD Initial Deep Scrub process, place the VPI ESD Initial Surface Cleaning Pad (natural in color, with black strands) onto low speed floor machine. Mist VPI ESD Initial Surface Cleaner, using the mist setting on a trigger sprayer, over the area to be cleaned. 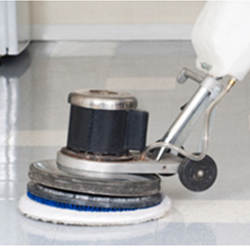 With the low speed machine, use the initial pass to evenly distribute the cleaner over the intended area to be surface cleaned (about a 10’x10’ area at a time) – then begin buffing action. Both sides of pad can be used.